After 3 games of Round 5, 2019. Squiggle: Now with Team Ins/Outs Awareness! Earlier this year, HPN unveiled a new model named PERT based on player ratings, instead of team ratings like most other models. And it’s landed with a splash, currently sitting atop the models leaderboard on 74 correct tips. It’s doing less well on Bits* and MAE*, which is a little suspicious, since those metrics tend to be better indicators of underlying model accuracy. But still! It’s enough to suggest there might be something in this crazy idea of considering who’s actually taking to the field. So I’m hopping aboard. Starting this week, Squiggle’s in-house model considers selected teams and adjusts tips accordingly. The difference that team selections make to each tip can be seen in the TIPS section of Live Squiggle. In most cases, team selections will make only a difference of a few points to the Squiggle tip, which remains focused on team-based ratings. The adjustment is derived from a simple comparison of scores from AFL Player Ratings. So it will only swing a tip when it’s already close to a 50/50 proposition. Over the last six years, this seems to deliver about a 0.40 point improvement in MAE. Naturally, though, 2018 will be the year it all goes to hell. * “Bits”: Models score points based on how confidently they predicted the correct winner. Confident & correct = gain points, unsure = no points, confident & wrong = lose points. * “MAE”: Mean absolute error, which is the average difference between predicted and actual margins, regardless of whether the correct winner was tipped. It’s another new model! Ken Massey is an internationally known sports statistician whose Massey Ratings cover a vast array of sports, including AFL. The Squiggle stable of models has grown to ten this year, and now includes almost all of the well-known public tipping models from across the web. These aren’t all mandatory. There are currently some very mysterious models included in the stable because they are widely known and respected. But this is the ideal. I know there are many solid tipsters with an Excel spreadsheet and a Twitter handle, which I don’t plan to list since they don’t meet the above criteria. Ultimately my goal is to expose more insight into the how and why of football analysis, looking not only at who is tipping best, but why. What is the best way to treat Home Ground Advantage? How much difference does the weather make? How important is it to consider player rankings, or recent form? What factors matter most in determining which side wins a game of football? So I made a new one! Now you can tip as few or as many games as you like and lean on the world’s best computer models to fill in the rest. You can even go back and change some of the computer tips if you want. I believe the world is a better place when people can generate wildly optimistic ladder projections with ease. At the moment it’s only for the home & away season, but I’ll probably add finals sometime later. The Predictor fetches data from the Squiggle API, including Aggregate tips from computer models such as The Arc, Matter of Stats, FMI, HPN and many more. This provides a tip for each match as well as a confidence rating about how likely the team is to win. It’s no good to simply tip the favourite in each game, though, because in real life, favourites don’t always win. For example, if two people play 10 games of chess, and one player is 60% likely to win each match, we want to be able to predict that the final tally will be about 6-4, and not 10-0, like we’d get if we tipped the favourite to win each time. So AutoTip runs several thousand simulations, each time applying an amount of randomness to the predicted result, so that a team that is 70% likely to win a match will only win it in about 70% of simulations. The simulations are then analyzed to determine the average finishing rank, number of premiership points, and percentage of each team. 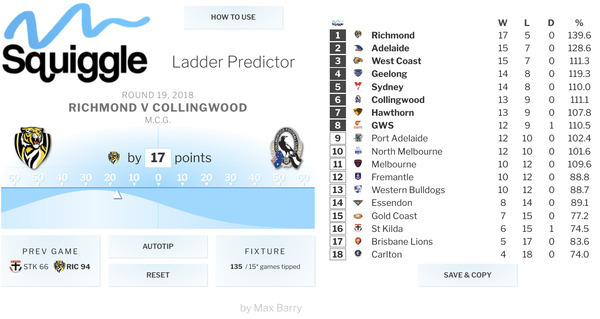 This provides a pretty reliable estimation of where each team is likely to wind up on the ladder. However, we don’t merely want average numbers: We want to see specific tips for each game. So next AutoTip scores each simulation based on how closely its ladder resembles the average. Then it selects the “most normal” one. This means AutoTip will contain many upsets, and which upsets they are will change each time. But the upsets will be spread around evenly, so that each team finishes the season about where they’re expected. Richmond have been doing two things Squiggle particularly likes: Holding oppositions to low scores, and generating plenty of scoring shots. The Tigers have been kicking plenty of behinds this season right from the start: In Round 1, they defeated Carlton by 4 goals and 14 behinds, while in losing to Adelaide the following round, they lost by 6 goals and 0 behinds. On the surface, that’s a close-ish 26 point win followed by a heavier 36-point defeat; in terms of scoring shots, it’s a +16 smashing followed by a much closer -6. Squiggle’s model considers the reality to be somewhere in between. As a result, it considers the Tigers’ only loss of the season so far to be a relatively close one, away interstate to a very good team – the kind of game that even a top team will often drop. The Tigers’ wins, on the other hand, have included some extraordinary smashings when viewed in terms of scoring shots. Richmond’s opposition to date has mostly included mid- to upper-tier rated teams in Adelaide, Collingwood, Hawthorn, and Melbourne, yet across the season’s 6 rounds, the Tigers have averaged 50% more scoring shots. The result is a lot of Squiggle love for the yellow and black. Most computer models of AFL have no awareness of who’s actually playing in either team. They rate the strength of competing clubs as an entity, rather than what they really are: a collection of moving parts, some of whom move a lot better than others. Earlier this year, HPN, the artist formerly known as Hurling People Now, launched PERT, a tipping model that draws on the ratings of the actual players, as determined by the PAV system. It’s early days, but PERT looks likely to add a fascinating new dimension to model-based tipping, and is definitely worth keeping an eye on. Because PERT tips depend on the announced teams, they come out later in the week and can alter based on last-minute personnel changes. I’m delighted to have HPN on board and PERT tips are now integrated into Squiggle dials and the leaderboard! Today I’m thrilled to welcome Swinburne University’s famous computer model! Running continuously since 1981, this is the country’s oldest and best-known AFL tipping model. The man behind the model, Professor Stephen Clarke, has kindly agreed to join in, and Swinburne is now included in the models leaderboard and tips pages. Due to confidentiality requirements, Swinburne margin and probability tips are embargoed until the completion of each game: until that point, only the name of the tipped team is displayed. It’s very exciting to have the great grandaddy of AFL computer models on board. Swinburne is off to a solid start this year, too, shooting straight to #1 on the Squiggle leaderboard! A good challenge for the rest of us. And that’s not all! Two more big ones coming next week. I’ve now fixed the code that dumbly extrapolated out scoring shots of live matches, the problems with which were kindly highlighted by North Melbourne and St Kilda last week. 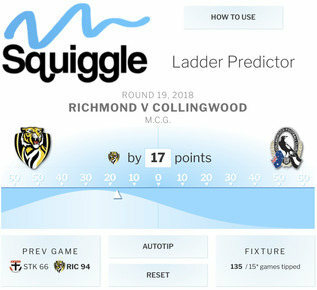 Squiggle would now project those 2nd-quarter scores of 2.9 (21) – 2.7 (19) out to 8.16 (64) – 10.15 (75)… which is more plausible. Although still not very close to the actual final scores of 13.17 (95) – 5.13 (43).